Dry skin is the most common result of seasonal weathering. Cold winter air lacks humidity and dries up natural oils in the skin, causing it to lose moisture and dull the complexion. 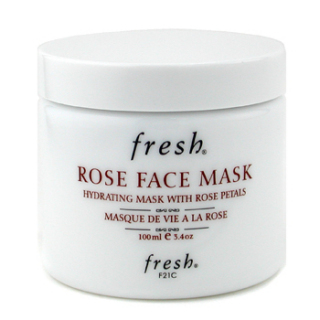 The Rose Face Mask by Fresh is an ultra-hydrating treatment that not only moisturizes, but soothes the skin. It reduces redness and calms inflammation – transforming the appearance of lackluster skin. The Rose Face Mask contains a gentle blend of ultra-soothing ingredients. Pure rose floral water rejuvenates the senses and helps to diminish redness and uneven skintone. Cucumber extract acts as an anti-inflammatory while pure aloe-vera gel cools and refreshes the skin. Protect your skin from winter woes this season with products that not only hydrate, but soothe and nourish the skin.